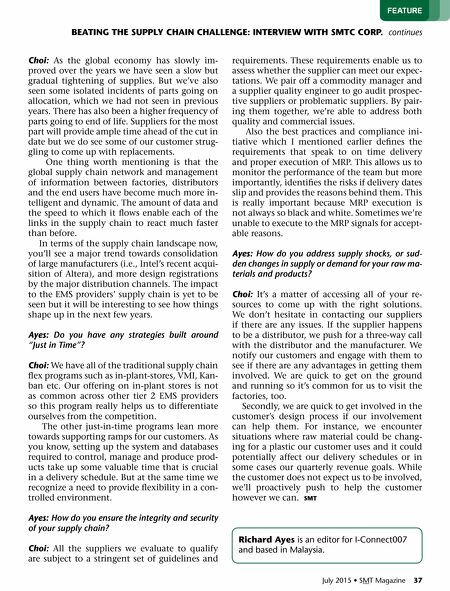 July 2015 • SMT Magazine 37 BEATING THE SuPPly CHAIN CHAllENGE: INTERVIEW WITH SMTC CORP. continues Choi: As the global economy has slowly im- proved over the years we have seen a slow but gradual tightening of supplies. But we've also seen some isolated incidents of parts going on allocation, which we had not seen in previous years. There has also been a higher frequency of parts going to end of life. Suppliers for the most part will provide ample time ahead of the cut in date but we do see some of our customer strug- gling to come up with replacements. One thing worth mentioning is that the global supply chain network and management of information between factories, distributors and the end users have become much more in- telligent and dynamic. The amount of data and the speed to which it flows enable each of the links in the supply chain to react much faster than before. In terms of the supply chain landscape now, you'll see a major trend towards consolidation of large manufacturers (i.e., Intel's recent acqui- sition of Altera), and more design registrations by the major distribution channels. The impact to the EMS providers' supply chain is yet to be seen but it will be interesting to see how things shape up in the next few years. Ayes: Do you have any strategies built around "Just in time"? Choi: We have all of the traditional supply chain flex programs such as in-plant-stores, VMI, Kan- ban etc. Our offering on in-plant stores is not as common across other tier 2 EMS providers so this program really helps us to differentiate ourselves from the competition. The other just-in-time programs lean more towards supporting ramps for our customers. As you know, setting up the system and databases required to control, manage and produce prod- ucts take up some valuable time that is crucial in a delivery schedule. But at the same time we recognize a need to provide flexibility in a con- trolled environment. 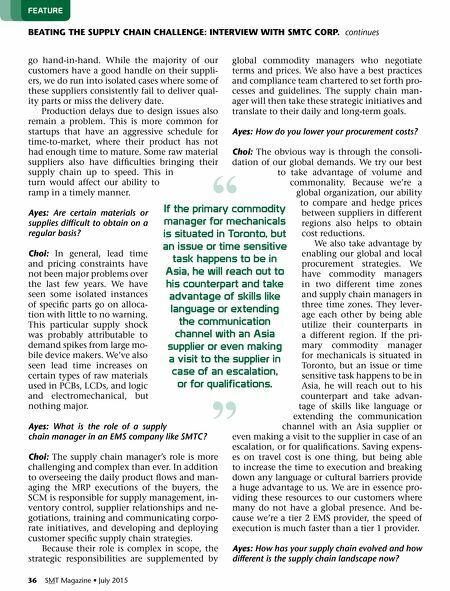 Ayes: how do you ensure the integrity and security of your supply chain? Choi: All the suppliers we evaluate to qualify are subject to a stringent set of guidelines and requirements. These requirements enable us to assess whether the supplier can meet our expec- tations. We pair off a commodity manager and a supplier quality engineer to go audit prospec- tive suppliers or problematic suppliers. By pair- ing them together, we're able to address both quality and commercial issues. Also the best practices and compliance ini- tiative which I mentioned earlier defines the requirements that speak to on time delivery and proper execution of MRP. This allows us to monitor the performance of the team but more importantly, identifies the risks if delivery dates slip and provides the reasons behind them. This is really important because MRP execution is not always so black and white. Sometimes we're unable to execute to the MRP signals for accept- able reasons. Ayes: how do you address supply shocks, or sud- den changes in supply or demand for your raw ma- terials and products? Choi: It's a matter of accessing all of your re- sources to come up with the right solutions. We don't hesitate in contacting our suppliers if there are any issues. If the supplier happens to be a distributor, we push for a three-way call with the distributor and the manufacturer. We notify our customers and engage with them to see if there are any advantages in getting them involved. We are quick to get on the ground and running so it's common for us to visit the factories, too. Secondly, we are quick to get involved in the customer's design process if our involvement can help them. For instance, we encounter situations where raw material could be chang- ing for a plastic our customer uses and it could potentially affect our delivery schedules or in some cases our quarterly revenue goals. While the customer does not expect us to be involved, we'll proactively push to help the customer however we can. SMT FeAture Richard Ayes is an editor for i-connect007 and based in Malaysia. Feature — Beating the Supply Chain Challenge: Interview with SMTC Corp. Column — Industry 4.0: Who Benefits?